Our Company | Belize Diesel & Equipment Company Ltd.
Belize Diesel & Equipment Co (1997) Ltd is the authorized distributor for Toyota, Daihatsu, Hino trucks, Massey Ferguson Tractors, Lister and Perkins Generators, Mercury Marine Outboards and Carryboy Accessories. 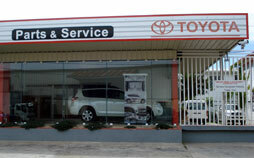 Since 1997 we have been offering top quality products, service and parts. Our main office is located in Belize City at 7142 Slaughterhouse Road and we also have a sales and service facility in Belmopan and at ADS in Dangriga. Our staff has been trained using the “Toyota Way” and we continue to invest in our human resources through kaizen and continuous training. Our technicians are certified by Toyota, Mercury and Massey Ferguson. As part of our continuous product line development, Belize Diesel Service Center located at 1 ml Northern Highway offers Texaco fuel, North Star Cafe and a car wash.
Our new showroom and sales offices at Slaughterhouse road are of high standards and offer a relaxed atmosphere. Belize Diesel Aftermarket offers a full line of high quality aftermarket parts for many popular brands like Toyota, Mitsubishi, Nissan, Ford, GM, Isuzu and other. Our relationship with clients is for the entire life cycle of the equipment we sell and service and we are making sure that we offer products that can meet what the clients are looking for. Belize Aftermarket is a discount auto parts store that offers just that, discount prices on aftermarket parts. Belize Diesel Tow service and body repairs is a division that offer body repairs, car storage, insurance settlement in the event that your vehicle was involved in an accident. To create a long-term relationship with each client, by providing products of high standards in quality and maintaining excellent customer service. We shall promote family oriented values within staff and customers and achieve respect within our community for being fair and helpful.